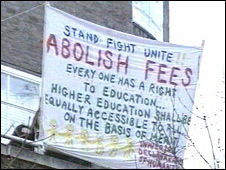 At one time student protest was as much a part of university life as getting drunk on Freshers' Week. Now a university is giving some of its politics students lessons in how to campaign and take direct action. The Sheffield Hallam students will have to conduct an activism project and campaign on a theme of their choice. Course leader Dr Annabel Kiernan said many students did not have time for protest as they were too busy working to pay off their tuition fee loans. She said: "It's less to do with the fact that students have changed, and more to do with the context of where they exist that has changed. "It's not that students aren't interested in politics but that there's less time for them to get involved. "The pressures of university life are different, they are probably working to help fund themselves - it's what happens when you expand university education." She said this course, a module on the politics BA, was a way of giving the students some experience of how to campaign. One of the contributors to the course, Stephen Kingston, editor of the Salford Star, said: "Courses like this are great. When I studied sociology at college it was all theory, there was no practice attached to it at all. "No-one here's talking about revolutions; we're talking about giving the community a voice and helping kids. "My advice to students and young people wanting to set up a paper, magazine or website is just do it yourself, get people involved and forget about budget because it just won't happen." The students on this year's course have chosen to run an anti-fascism campaign and a voting drive in the run-up to next year's general election.